St. Thomas Becket (December 21, 1118 – December 29, 1170) Lord Chancellor from 1154 to 1162 and Archbishop of Canterbury from 1162 to 1170. He is venerated as a saint and martyr by both the Roman Catholic Church and the Anglican Church. He engaged in conflict with King Henry II over the rights and privileges of the Church and was assassinated by followers of the king in Canterbury Cathedral. He is also commonly known as Thomas à Becket, although some consider this incorrect. Becket was an eager participant in the power struggle between church and state. As Lord Chancellor he defended the interests of the king but when he became Archbishop of Canterbury he defended the interests of the church. His unwillingness to compromise and see the merits of the other side led to his downfall. He resisted the attempt of the King to ensure that criminous clergy were tried and punished in the lay courts. The king and people had a legitimate interest in seeing that priests who committed serious crimes, such as murder, should be liable to punishment by the lay authorities just like any other of the king's subjects. Although there was an outcry over his murder, the principle upon which he made a stand was eventually overturned during the Reformation. As a self-made man, Becket was always jealous of the marks of privilege and status of his office; which translated whilst chancellor into sumptuous ostentation, and transmuted when archbishop into the vestments and horsehair shirt of a religious ascetic. He was proud and uncompromising and enjoyed the drama of being at the center of attention. He could have avoided being killed but seems to have deliberately chosen martyrdom. Thomas Becket was born in c.1118 in Cheapside, London, to Gilbert Beket of Thierville and Matilda (with a familiar name of Roheise or Rosea) of Mondeville near Caen. His parents, of the Rouen upper-middle class, were buried in Old St. Paul's Cathedral. One of Thomas' father's rich friends, Richer de L'aigle, was attracted to the sisters of Thomas. He often invited Thomas to his estates in Sussex. There, Thomas learned to ride a horse, hunt, behave, and engage in popular sports such as jousting. When he was ten years of age, Becket received an excellent education in "Civil & Canon Law" at Merton Priory in England and then overseas at Paris, Bologna, and Auxerre. Richer was later a signer at the Constitution of Clarendon against Thomas. 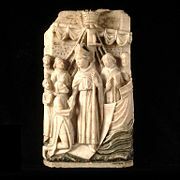 Upon returning to the Kingdom of England, he attracted the notice of Theobald of Bec, Archbishop of Canterbury, who entrusted him with several important missions to Rome and finally made him archdeacon of Canterbury and provost of Beverley. He so distinguished himself by his zeal and efficiency that Theobald commended him to King Henry II when the important office of Lord Chancellor was vacant. Henry, like all the Norman kings, desired to be absolute ruler of his dominions, both Church and State, and could find precedents in the traditions of the throne when he planned to do away with the special privileges of the English clergy, which he regarded as fetters on his authority. As Chancellor, Becket enforced the king’s danegeld taxes, a traditional medieval land tax that was exacted from all landowners, including churches and bishoprics. This created both a hardship and a resentment of Becket among the English Churchmen. To further implicate Becket as a secular man, he became an accomplished and extravagant courtier and a cheerful companion to the king's pleasures. He was so devoted to his master's interests with such a firm and yet diplomatic thoroughness that scarcely anyone, except perhaps John of Salisbury, doubted his allegiance to English royalty. King Henry even sent his son Henry, later the "Young King," to live in Becket's household, it being the custom then for noble children to be fostered out to other noble houses. Later, that would be one of the reasons his son would turn against him, having formed an emotional attachment to Becket as a foster-father. Henry the Young King was reported to have said Becket showed him more fatherly love in a day than his father did his entire life. When Archbishop Theobald died April 18, 1161, Henry conceived what must have seemed a neat solution to the problem of the imposing of his will upon the church: installing his friend Becket who, in his eight years as lord chancellor, had consistently taken a firm line with the church. So much to the indignation of the church Henry arranged for Becket's appointment as the new archbishop. He was elected in May, and consecrated on June 3, 1162, in accordance with the king's wishes. Stained glass window of Thomas Becket in Canterbury Cathedral. At once, there took place, before the eyes of the astonished king and country, an unexpected transformation in the character of the new archbishop. Having previously been a merry, pleasure-loving courtier, Becket became an ascetic prelate in simple monastic garb, fully devoted to the cause of the hierarchy and prepared to do his utmost to defend it. Most historians agree that Becket begged the king not to appoint him archbishop, knowing that this would occur, and even warning the king that he could not be loyal to two masters. Henry could not believe that his closest friend would forsake their friendship and appointed him to the archbishopric anyway—something he came to regret for the rest of his life. In the schism which at that time divided the Church, Becket sided with Pope Alexander III, a man whose devotion to the same strict hierarchical principles appealed to him, and from Alexander, he received the pallium at the Council of Tours. 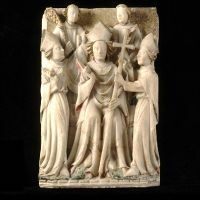 On his return to England, Becket proceeded at once to put into execution the project he had formed for the liberation of the Church in England from the very limitations which he had formerly helped to enforce. His aim was twofold: the complete exemption of the Church from all civil jurisdiction, with undivided control of the clergy, freedom of appeal, etc., and the acquisition and security of an independent fund of church property. About one in six of the population of England were clergymen, many of whom were not ordained to the priesthood. All clergy could claim the right to be tried in ecclesiastical courts where they would invariably receive a more lenient sentence than if tried in the criminal courts of the land. When Henry arrived back in England after a stay in France, he was told that, while he had been away, there had been a dramatic increase in serious crime. The king's officials claimed that over a hundred murderers had escaped their proper punishment because they had claimed the right to be tried in church courts. Henry's problem was the need to restore order after the chaos which marked the civil war between King Stephen and Empress Matilda. For Becket, the King's concern over criminous clerks touched on the question of clerical immunity from secular jurisdiction. The king was quick to perceive the inevitable outcome of the archbishop's attitude and called a meeting of the clergy at Westminster (October 1, 1163), at which he demanded that they renounce all claim to exemption from civil jurisdiction and acknowledge the equality of all subjects before the law. The bishops were inclined to yield, but the archbishop stood firm. Henry was not ready for an open breach and offered to be content with a more general acknowledgment and recognition of the "customs of his ancestors." Thomas was willing to agree to this, with the significant reservation "saving the rights of the Church." But this involved the whole question at issue, and Henry left London in anger. King Henry II presided over the assemblies at Clarendon Palace on January 30, 1164. A series of legislative procedures were drawn up and passed called The Constitutions of Clarendon. They were composed of 16 articles and represent an attempt to restrict ecclesiastical privileges and curb the power of the Church courts and the extent of Papal authority in England. In the anarchic conditions of Henry II's predecessor, Stephen, the church had extended its jurisdiction in the void. It was claimed that Constitutions would restore the judicial customs observed during the reign of Henry I (1100–35), while in fact they were a part of Henry II's larger expansion of royal jurisdiction into the Church and civil law, which was the defining aspect of his reign. The Constitutions' primary goal was to deal with the controversial issue of "criminous clerks," or clergy who had committed a serious crime but escaped justice via ecclesiastical courts by "benefit of Clergy." Unlike royal courts, ecclesiastical courts were more sympathetic to clergy. An ecclesiastical case of murder often ended with the defendant being defrocked (dismissed from the priesthood). In a royal court, murder was often punished with mutilation or death. The Constitutions of Clarendon were Henry II's attempts to rein in the problem by claiming that once the ecclesiastical courts had tried and defrocked clergymen, the Church could no longer protect the individual, and convicted former clergy could be further punished under the jurisdiction of secular courts. Becket resisted the Constitutions, especially the clause concerning "criminous clerks." He claimed no man should be placed in double jeopardy. The Bishops agreed to sign and finally, even Becket expressed his willingness to agree to the substance of the Constitutions of Clarendon, but he still refused to formally sign the documents. This meant war between the two powers. Henry summoned Becket to appear before a great council at Northampton Castle on October 8, 1164, to answer allegations of contempt of royal authority and malfeasance in the Lord Chancellor's office. Becket denied the right of the assembly to judge him and appealed to the Pope. Asserting that his life was too valuable to the Church to be risked, he went into voluntary exile on November 2, 1164, embarking in a fishing-boat which landed him in France. He went to Sens, where Pope Alexander was. Envoys from the king hastened to work against him and requested that a legate should be sent to England with Denary authority to settle the dispute which Alexander declined. When Becket arrived the next day and gave a full account of the proceedings, Alexander was still more confirmed in his aversion to the king. Henry pursued the fugitive archbishop with a series of edicts, aimed at all his friends and supporters as well as Becket himself; but Louis VII of France received him with respect and offered him protection. He spent nearly two years in the Cistercian abbey of Pontigny, until Henry's threats against the order obliged him to move to Sens again. Becket sought to exercise the prerogatives of the Church, particularly the weapons of excommunication and interdict. Pope Alexander III, though sympathizing with him in theory, favored a more diplomatic approach. Differences thus arose between Pope and Archbishop, which became even more bitter when legates were sent in 1167 with authority to act as arbitrators. Disregarding this limitation on his jurisdiction, Becket continued to reject any limitations on the rights of his order. After another failed arbitration by Papal legates in the presence of the King of France, in April 1169, Becket excommunicated twenty people who had stood with Henry. Becket's firmness seemed about to meet with its reward when, in 1170, the Pope was on the point of fulfilling his threats and excommunicating the entire population of England. At that point Henry, alarmed by the prospect, held out hopes of an agreement that would allow Thomas to return to England and resume his place. Even though both men met at a wooded area outside Paris and negotiated an apparent reconciliation, Becket refused to compromise on any issue whatsoever. On his return to England he re-affirmed the Church's authority with even more stridency and obstinacy. In June 1170, the archbishop of York and the bishops of London and Salisbury held the coronation of Henry the Young King in York. This was a breach of Canterbury's privilege of coronation, for which the Pope suspended the three. But for Becket, that wasn't enough, and in November 1170, he excommunicated all three. While the three bishops fled to the king in Normandy, Becket continued to excommunicate his opponents in the church. Soon word of this reached Henry who was in Normandy at the time. After these latest venomous reports of Becket's activities, Henry is reported to have raised his head from his sickbed and roared a lament of frustration. Passionate words from the angry king (reputedly: "Will no one rid me of this meddlesome priest?," "Who will rid me of this low-born priest?," "Who will rid me of this turbulent priest?," or even "What a band of loathsome vipers I have nursed in my bosom who will let their lord be insulted by this low-born cleric!"). Whatever the King said, it was interpreted as a royal command, and four knights, Reginald FitzUrse, Hugh de Moreville, William de Tracy, and Richard le Breton, set out to consult the Archbishop of Canterbury. On 29 December 1170 they arrived at Canterbury. According to accounts left by the monk Gervase of Canterbury and eyewitness Edward Grim, they placed their weapons under a sycamore tree outside the cathedral and hid their mail armour under cloaks before entering to challenge Becket. The knights informed Becket he was to go to Winchester to give an account of his actions, but Becket refused and the knights retired to bed. The following day while Becket was leading morning mass they tried to drag him away but he resisted. During the struggle he received a blow to the head and the knights attacked him with their swords. He died later that afternoon. It is generally accepted by historians that it was not Henry's will that Becket should be killed. Knowing the knights would probably return the next day, Becket could also have chosen to escape. Instead in an act of high drama he led the morning mass almost setting himself up to be martyred. Plantagenet historian John Harvey believes "The martyrdom of Thomas Becket was a martyrdom which he had repeatedly gone out of his way to seek...one cannot but feel sympathy towards Henry". 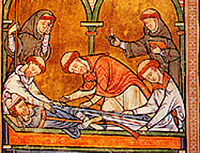 Following his death, the monks prepared his body for burial. It was discovered that Becket had worn a hairshirt under his archbishop's garments. Soon the faithful throughout Europe began venerating Becket as a martyr. Henry had lost the argument and was abused throughout Europe. In 1173—barely three years after his death—Becket was canonized by Pope Alexander III. On July 12, 1174 Henry humbled himself with public penance at Becket's tomb, which became one of the most popular pilgrimage sites in England. Henry was forced to give in on the problem of criminous clerks, and this fundamental concession would create problems between church and state right down to the Reformation. In 1220, Becket's remains were relocated from this first tomb to a shrine in the recently completed Trinity Chapel where it stood until it was destroyed in 1538, around the time of the Dissolution of the Monasteries, on orders from King Henry VIII. The king also destroyed Becket's bones and ordered that all mention of his name be obliterated. The pavement where the shrine stood is today marked by a lit candle. Modern day archbishops celebrate the Eucharist at this place to commemorate Becket's martyrdom and the translation of his body from his first burial place to the new shrine. Local legends in England connected with Becket arose after his canonization. Though they are hagiographical stories, they also display Becket’s particular gruffness. Becket’s Well in Otford, Kent is said to have been created after Becket had become displeased with the taste of the local water. Two springs of clear water are said to have bubbled up after he struck the ground with his crozier. The absence of nightingales in Otford is also ascribed to Becket, who is said to have been so disturbed in his devotions by the song of a nightingale that he commanded that none should sing in the town ever again. In the town of Strood, also in Kent, Becket is said to have caused that the inhabitants of the town and their descendants be born with tails. The men of Strood had sided with the king in his struggles against the archbishop, and to demonstrate their support, had cut off the tail of Becket’s horse as he passed through the town. 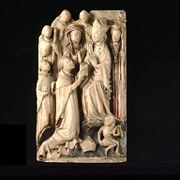 Geoffrey Chaucer's The Canterbury Tales is set in a company of pilgrims on their way to the shrine of St. Thomas Becket in Canterbury Cathedral. 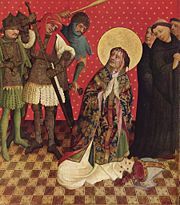 Modern works based on the story of Thomas Becket include T. S. Eliot's play Murder in the Cathedral and Jean Anouilh's play Becket, which was made into a movie with the same title. In the nineteenth century, Conrad Ferdinand Meyer wrote the novella Der Heilige (The Saint) about Thomas Becket. Ken Follett's novel The Pillars of the Earth is a fictional account of the struggles between the church and gentry, culminating in the assassination and martyrdom of Becket by Henry's men (the fictionalized account is very accurate, right down to the day of the week, and the wounding of Edward Grim, but adds one of the book's fictional villains as the fifth attacker). St. Thomas of Canterbury remains the patron saint of Roman Catholic secular clergy. In the Roman Catholic calendar of saints, his annual feast day is December 29. The Thomas Tower in Basel, Switzerland, is named after Thomas Becket. The Becket School is a secondary school in Nottingham, UK, named after Thomas Becket. ↑ He was allegedly given the "à" in his name many years after he died by uncertain sources perhaps with the subliminal intention of alluding to Thomas à Kempis (1380–1471), supposed author of "The Imitation of Christ" (ca. 1418; many other authorships have been ascribed). However, the Oxford Dictionary of English, the New Oxford Dictionary for Writers and Editors and Chambers Biographical Dictionary all prefer St Thomas à Becket. ↑ Frank Barlow, Oxford Dictionary of National Biography (Oxford University Press, 2004). ↑ The Becket Fund for Religious Liberty, Becket Fund Retrieved March 16, 2008. Anouilh, Jean. Becket; Or, The Honor of God. New York: Coward-McCann, 1960. Sudeley, The Rt. Hon. The Lord. Becket's Murderer - William de Tracy, in Family History, Canterbury, August 1983, vol.13, no.97, pps: 3 - 36. Winston, Richard. Thomas Becket. New York: Knopf, 1967. This page was last modified on 4 December 2015, at 21:00.